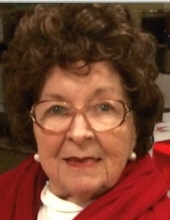 Grace ”Jerri” Geraldine Roberts Redman passed away Saturday, January 26, 2019. She was born May 18, 1924 in Terre Haute, Indiana to John Roberts and Josephine Thompson Roberts. She was preceded in death by her parents, two brothers, two sisters, and her husband of 65 years, Ernest “Herb” Herbert Redman, Jr. Survivors include her brother John W. Roberts Jr. of Las Vegas, Nevada; daughter, Linda Lance of Indianapolis; her son, Jeff Redman and wife Barbara of Terre Haute, granddaughters Lori Honer and husband Gary of Indianapolis; Beth Hunley and husband Tony of Fort Lewis, Washington; Vicki Cloney and husband Robert of Paisley, Scotland; Sarah Diaz and husband Ivan of Danville, Indiana; and Maggie Rhodes and husband Kyle of Terre Haute. Survivors also include 8 great grandchildren. Jerri began working at Terre Haute First National Bank (now First Financial Bank) in 1962 and retired in 1984 as the Assistant Vice President and Manager at the Main Office. She was the first female branch manager at the bank. She was a charter member of Memorial United Methodist Church, member of Rebekah’s, and served on the American Heart Association Board for 25 years. She was also a member of Terre Haute Business and Professional Women, Women Accountants, Wabash Valley Chapter of the American Institute of Banking and a spokesperson for the Spay and Neuter League. Funeral services will be at 11:00 a.m., Thursday, January 31, 2019 in Memorial United Methodist Church with Reverend Scott Johnson officiating. Burial will be in Roselawn Memorial Park. Visitation will be from 4:00 – 8:00 p.m. on Wednesday at the church. In lieu of flowers contributions may be made to Memorial United Methodist Church. Arrangements are under the direction of Callahan & Hughes Funeral Home, 605 South 25th Street. To send flowers or a remembrance gift to the family of Grace "Jerri" Redman, please visit our Tribute Store. "Email Address" would like to share the life celebration of Grace "Jerri" Redman. Click on the "link" to go to share a favorite memory or leave a condolence message for the family.